Hostel City Center Sarajevo i Sarajevo, Bosnia og Herzegovina: Bestill nå! *Parking* Private parking is possible at a location nearby (reservation is not needed) and costs EUR 10.00 per day. The Hostel City Center Sarajevo is the small and relaxed Hostel in Sarajevo - the ideal place for travellers seeking the true spirit of Sarajevo. Guests can use two large living and common rooms where they can spend some pleasant time watching cable TV, checking their e-mails, surfing the web or drinking beer with wanderlust guests. And there is also free use of the kitchen, of course. * Please remember that 3 Bed Apartment has 1 bedroom with double bed 2 bedroom with 2 x single bed, cosy living room, private bathroom, A/C, cable TV, Wi-Fi. Apartment is not in the same building where the Hostel is. 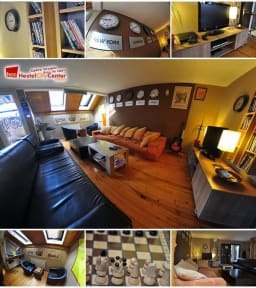 Apartment is located 1 minute walk from the Hostel. Breakfast is not included in apartment price. Rooms : All Rooms have Air Conditioning !